I know about apple picking. And peach picking. And this summer I learned about blueberry picking. But sunflower picking? I had never heard of it. Let alone know that it was a thing you could do around Greenville, SC. But it is. And it was a lot more fun than I thought it would be. 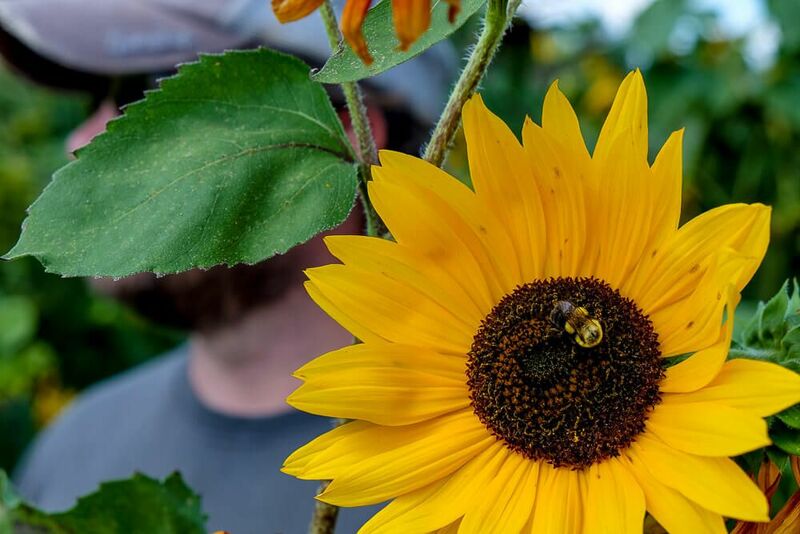 So if you’re looking for a weekend activity this fall, then maybe you should put sunflower picking in Greenville SC on your list. 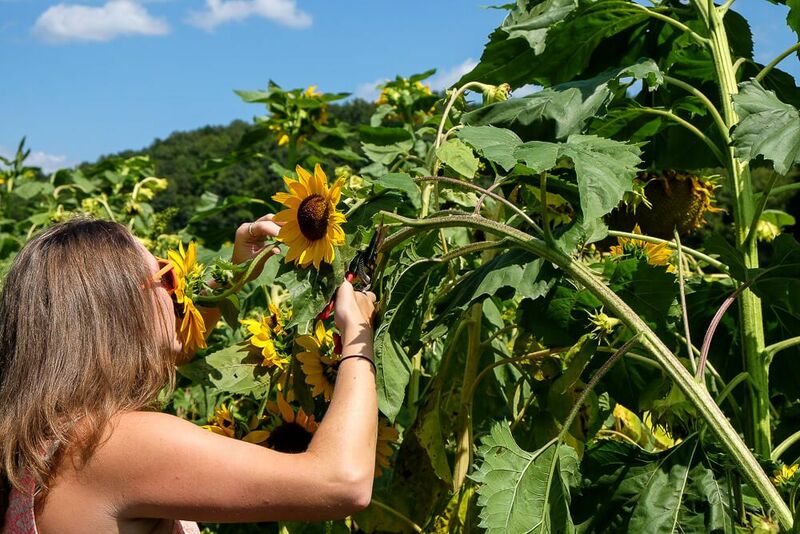 I first found out about sunflower picking via this article in a morning newsletter. And I was instantly intrigued. 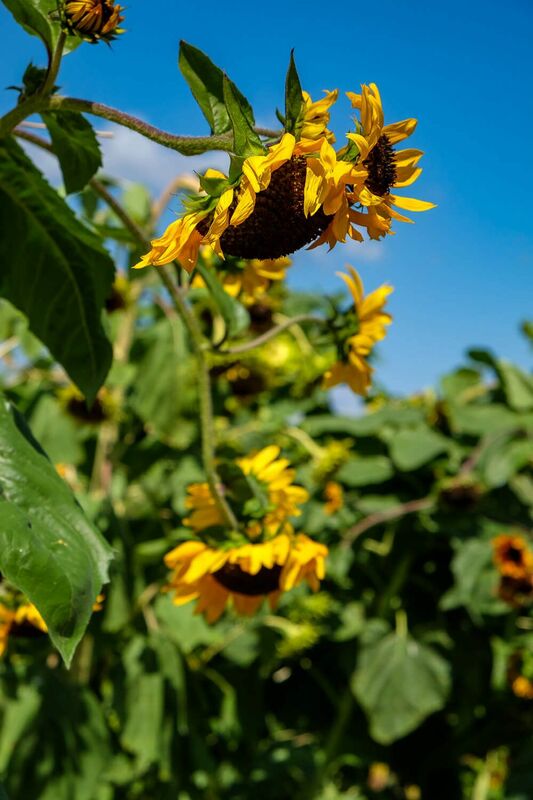 Sunflower picking? I’ve seen images of giant sunflowers. You know the ones that tower over you. 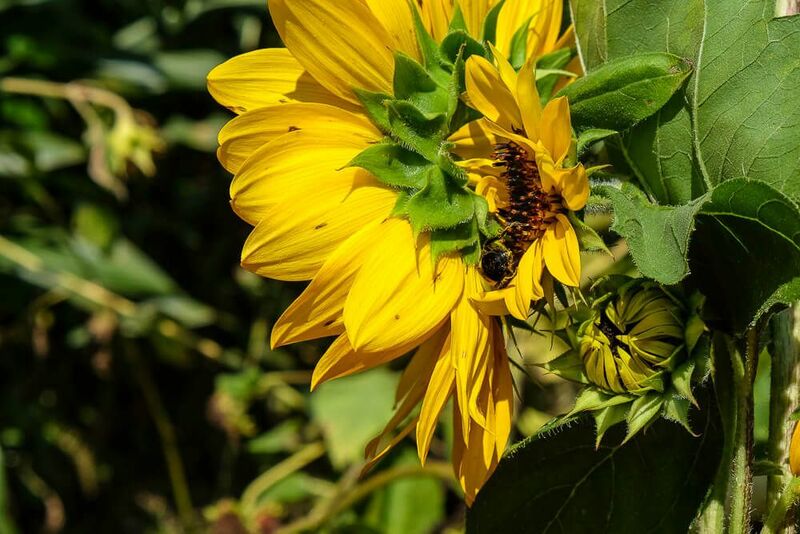 The ones where the center of the sunflower is as a big as your head. 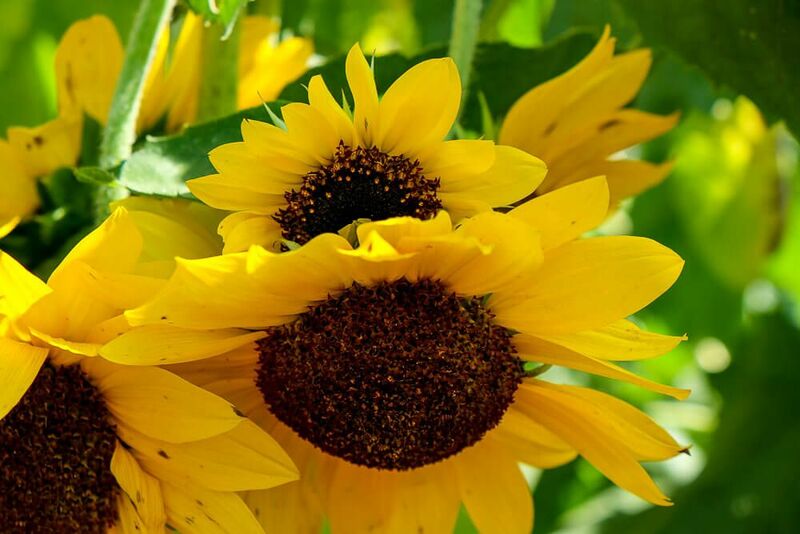 (Also what do you call the center of a sunflower?) But alas, I had never seen a sunflower that big. And here there was a whole field of them? Just waiting for me? Oh game on. So since it was the beginning of September (and apparently also sunflower season), I told Ryan we would be going the next weekend we were in town. Beechwood Farms is only about 20-30 minutes outside of Greenville (up past Traveler’s Rest). And our whole excursion there and back took maybe 1.5 hours. The farm stand itself is a small thing on the side of the road. There’s a small market inside (with fresh veggies galore). 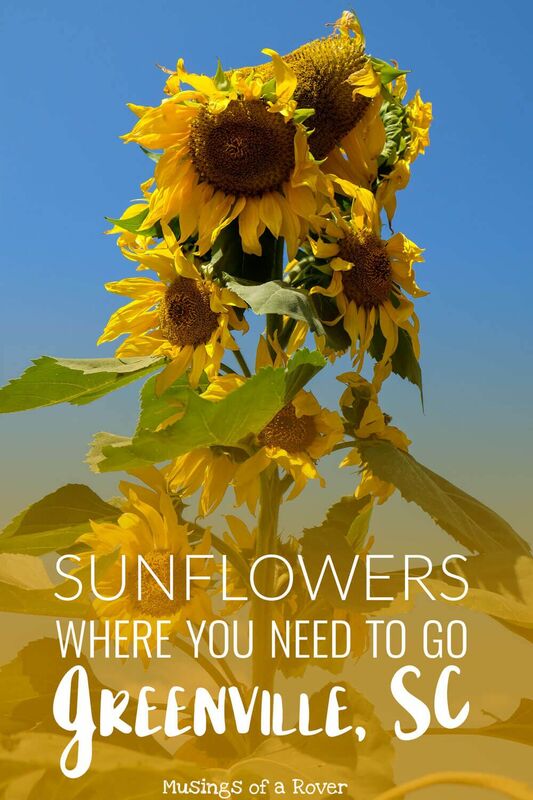 But there are only a few signs hanging on the walls mentioning the sunflower picking. These signs detailed the pricing (more on this in the Nitty Gritty below), but nothing on the details. 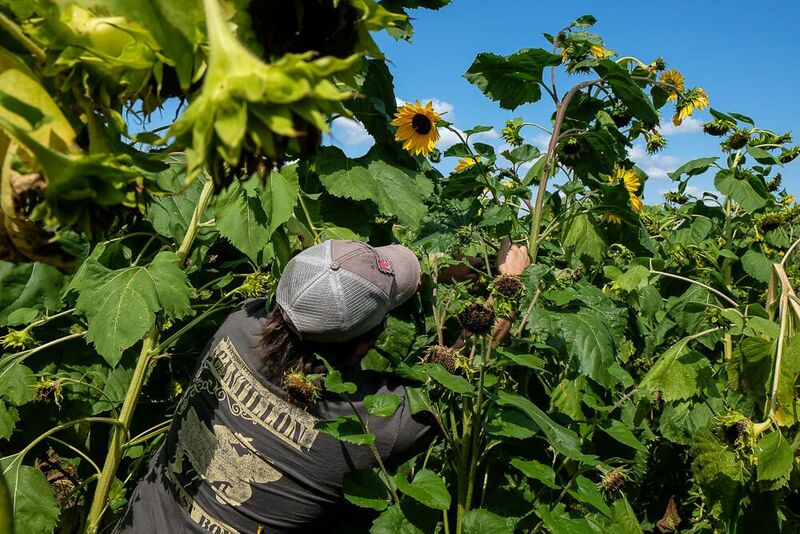 I was able to ask one of the guys working the front register about the sunflower picking. 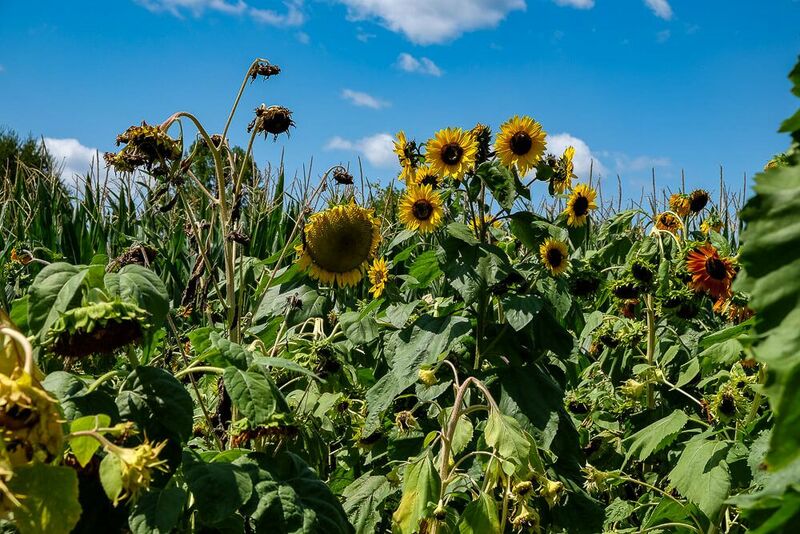 Basically you just head on back behind the farm stand to where the sunflowers are and have at it. There are two main fields, one to the left and one to the right. 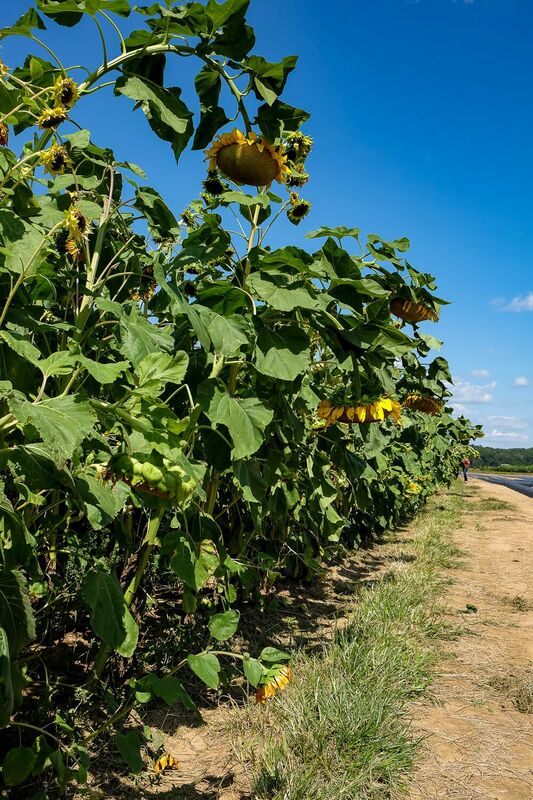 Each field has a few rows of sunflowers. 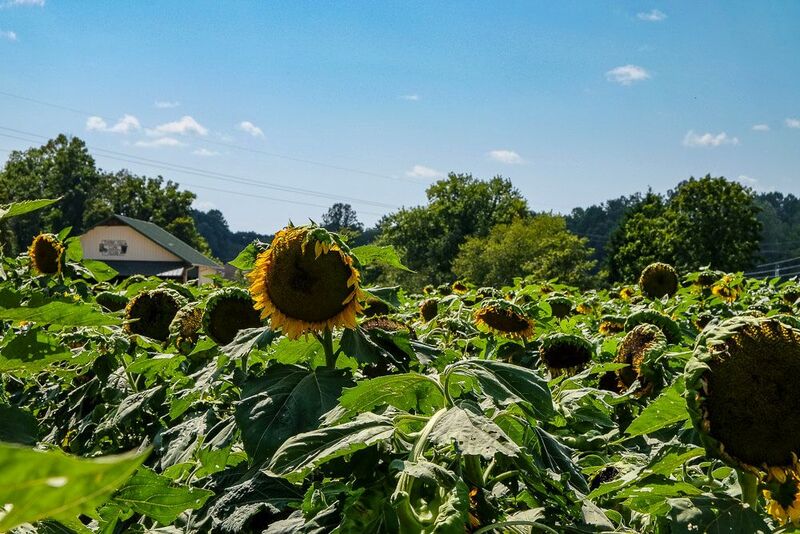 There you pick your sunflowers and then head back to the farm stand to purchase. Since we brought our own clippers we headed on back to the left field and that was where the fun began. Now these sunflowers were HUGE! Like some towered over me. By several feet. I couldn’t believe it. But when it came to the actual picking, I didn’t want to pluck any of these. They were too big and were actually not that beautiful. Just huge and amazing. But not something I wanted to put in a vase. 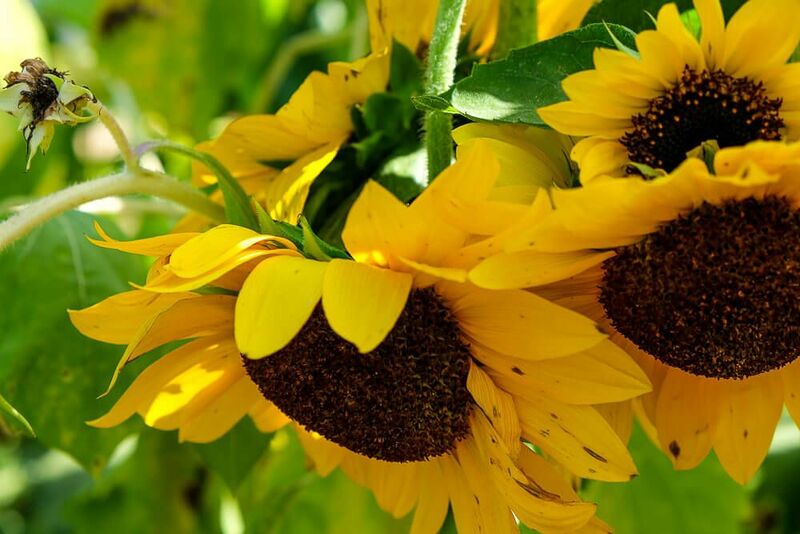 Instead I set my sights on medium sized flowers with bright, yellow petals. Ryan and I made our way down the outside row until I spotted the flower through the leaves. That was the one I wanted. It was beautiful and golden and was the perfect size. 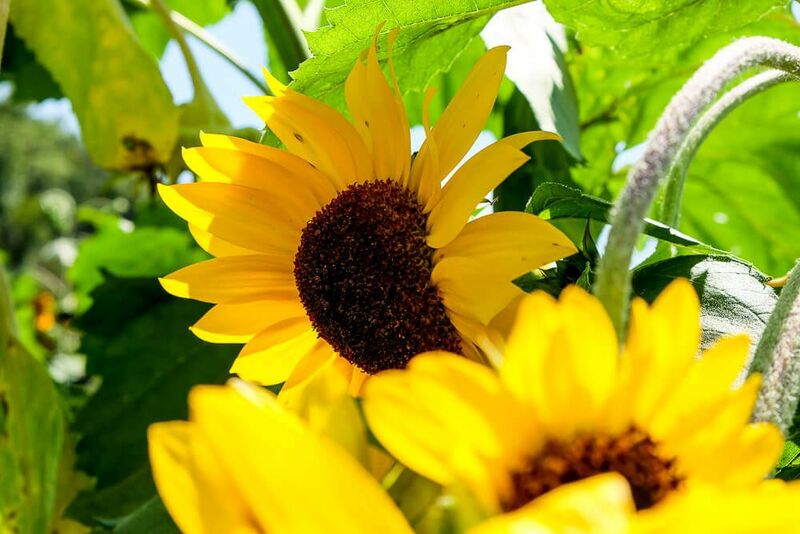 I carefully made my way into the sunflowers and through the rows until I reached it on the back side. Note that this was actually a lot harder that it sounds. 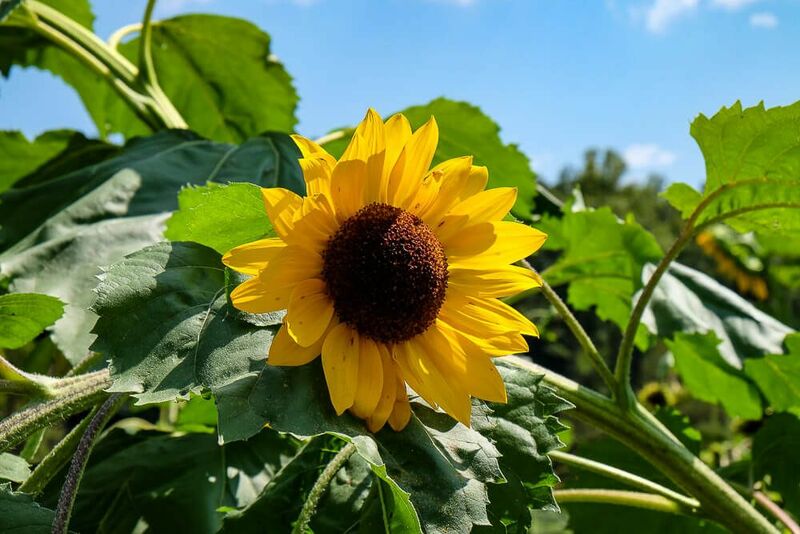 The sunflowers were huge, and they were planted close together. 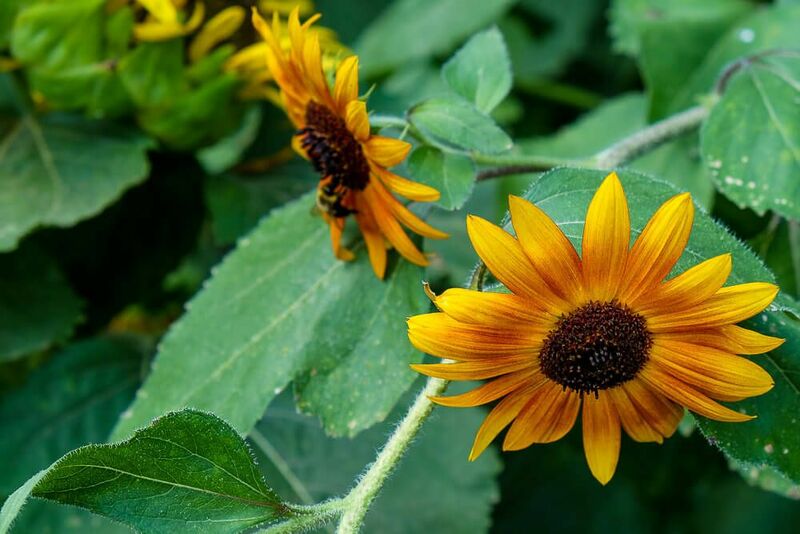 There was a lot of shimmying, ducking, stepping over, and squeezing by to get in and among the sunflowers. But once I was in the back row, I had a bit more space. I found the sunflower that had caught my eye and carefully cut it. It was beautiful, and its petals were incredibly soft. Almost like butter under my fingers. Ryan and I kept walking down the back row. 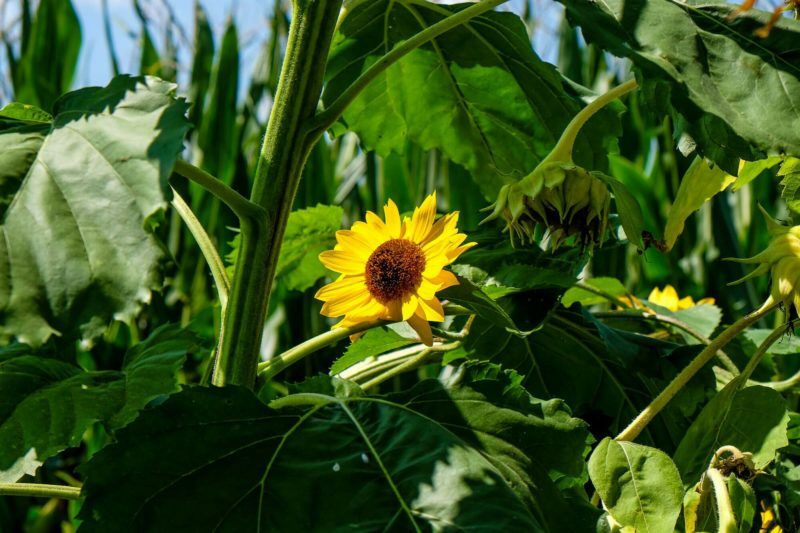 Corn towered over us to the left and sunflowers to the right. Finally we spotted another opening and were able to make our way back to the outside row. Though of course we spotted another amazing sunflower on the way, and I just had to stop to cut it (or actually ask Ryan to cut it). 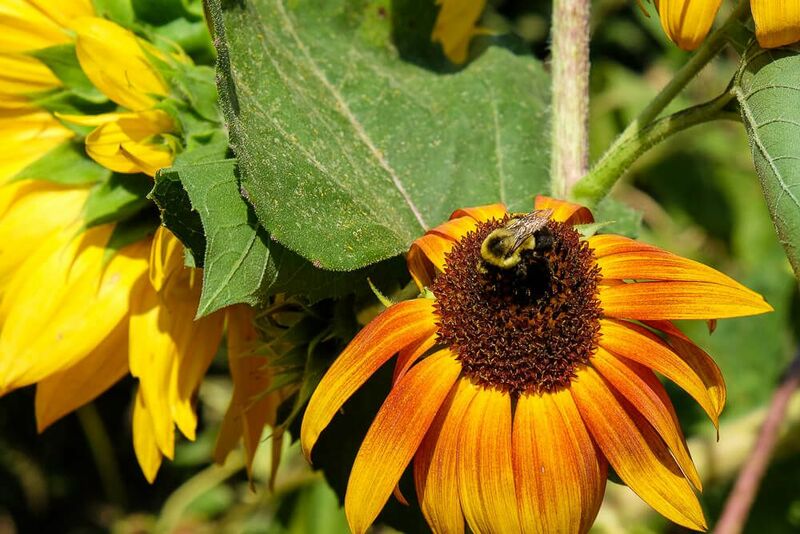 The bee happily stayed on the sunflower for quite some time as I took photos of it and we walked on down the row. Like for literally 10 minutes he chilled on the sunflower, doing his bee thing. As someone who is kind of terrified of flying insects, this was disconcerting at first, but then I started to get accustomed to him being there. In total we picked 3 sunflowers (1 bunch and 2 flowers). The only sad part was that the orange ones started to wilt immediately. Once we noticed this, we didn’t linger too long in the field after we’d gone up and down the row. We wanted to get these guys in water stat and I even sacrificed my water bottle on the drive home so they could have it. After a couple of hours in a vase back home though, most of the orange ones did perk back up. Only the really wilted ones on the bunch were goners. Overall this was a very fun and quick fall outing. And it was a chance to experience those super large sunflowers I had only ever seen before in pictures. They are real. 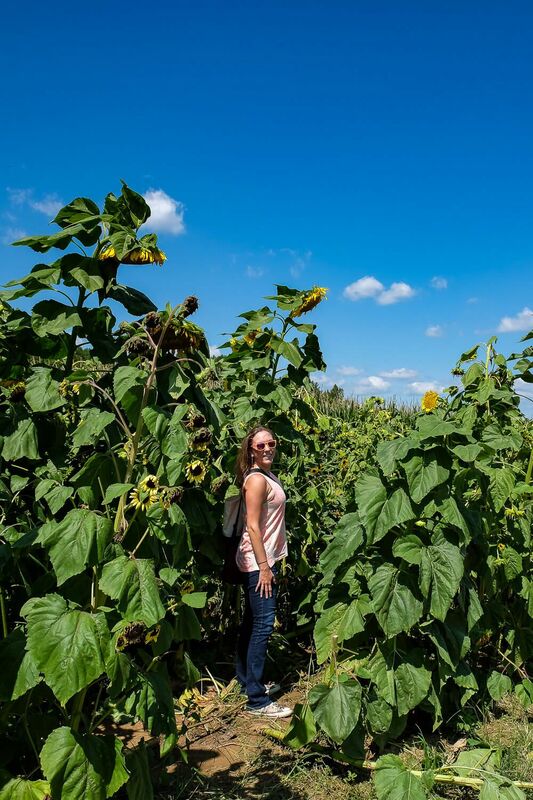 And I couldn’t believe that one sunflower could grow to like 10 feet tall. It was definitely something I was excited to see. And now I have a vase filled with blooming sunflowers sitting in my kitchen. Definitely $10 well spent. 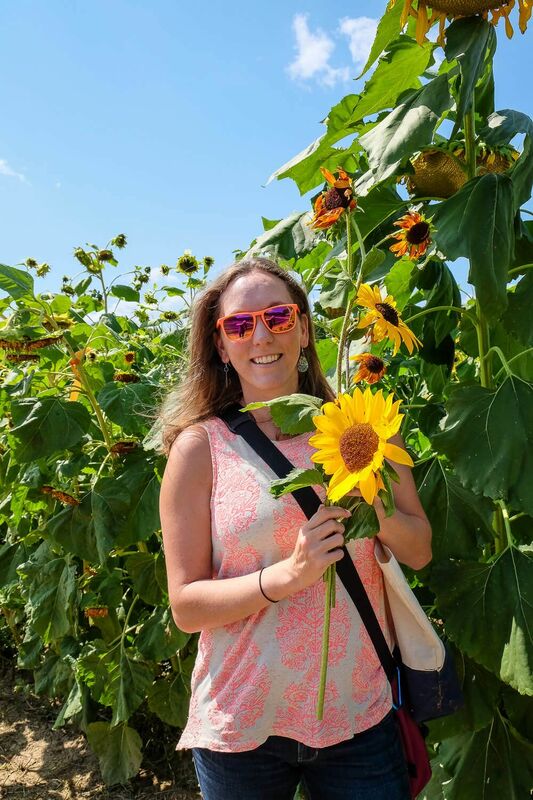 Are you interested in sunflower picking in Greenville SC? $20 to take pictures, but this is waived if you buy at least one flower or produce from the stand. So at $2 a flower, why would anyone pay this?????? The farm stand also has plenty of veggies for sale as well (and I definitely stocked up on some for the week before heading out). My total for like 3 big bags of veggies (including small pumpkins solely for decoration) was $15. You can find the location on Google Maps. Want to See Some Red Pandas?